Laura Lam's adult sci-fi debut False Hearts: Two formerly conjoined sisters are ensnared in a murderous plot involving psychoactive drugs, shared dreaming, organized crime, and a sinister cult. Raised in the closed cult of Mana's Hearth and denied access to modern technology, conjoined sisters Taema and Tila dream of a life beyond the walls of the compound. When the heart they share begins to fail, the twins escape to San Francisco, where they are surgically separated and given new artificial hearts. From then on they pursue lives beyond anything they could have previously imagined. Ten years later, Tila returns one night to the twins' home in the city, terrified and covered in blood, just before the police arrive and arrest her for murder--the first homicide by a civilian in decades. Tila is suspected of involvement with the Ratel, a powerful crime syndicate that deals in the flow of Zeal, a drug that allows violent minds to enact their darkest desires in a terrifying dreamscape. Taema is given a proposition: go undercover as her sister and perhaps save her twin's life. But during her investigation Taema discovers disturbing links between the twins' past and their present. Once unable to keep anything from each other, the sisters now discover the true cost of secrets. LAURA LAM was raised in San Francisco and currently resides in Scotland. She is known for her young adult books, and her novel Pantomime was a Bisexual Award winner as well as being a Top 10 Title for the American Library Association's Rainbow List. 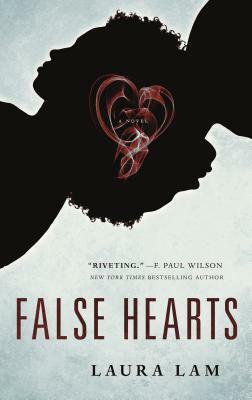 False Hearts is her first novel for adults.